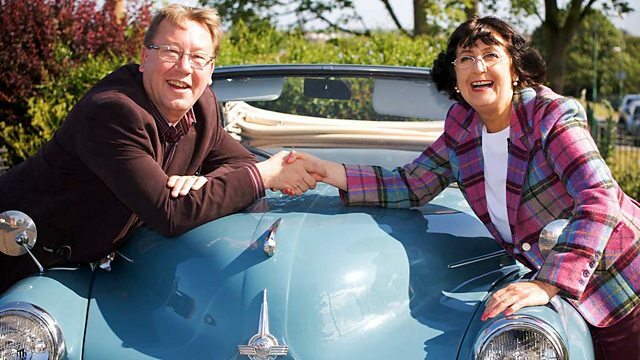 On the third leg of the road trip, Charlie Ross and Margie Cooper begin at Perth and head towards the North Sea coast for an auction in Fife at St Andrews. That couldn't be more Scottish, could it, with the thistle? And Margie Cooper, a bit Scottish, too, don't you think? Not one of the coopers of Fife, by any chance? Rosco's favourite subject - cricket. ..Although he does own a kilt. certainly knows what's under one. there's been a lot more fun that profits. If I were you I'd cry. to increase that by just £1. What do you do in real life, are you a dealer? Careful, Charlie. What's the Gaelic for Schadenfreude? -Have you ever been to Perth? I agree, especially down by the River Tay. After you, darling, look at all this lot. -Look add all these goodies! selling a mix of antiques and vintage pieces. as well as the manager, of course. -I'm going to have a good look round, so you're the man to call? I went past these rather splendid cannons. I don't think the carriages have much age, do they? But the barrels look wonderful! -And they appear to be old. All for the bargain price of £40. I thought you might say that, I should have said "20". I would be honestly stupid. Thank you very much indeed. How wonderful! That's about two yards from the door. and could easily spend more of it here. has found a gem and a fine selection of cabinets. You think it's a cheese knife and a pickle fork? I think there's a bit of confusion about what exactly that is. For those who like their fruit on the move. Have we got a date on this? and I'm in a bit of trouble at the moment. Let me just take a look at that. Sometimes they're a year out, aren't they? Yeah. May not to be a matching set. and it's still all right. It's all right, yeah, it is! -and it's got to be a lot cheaper than that. is busy looking for more. Hello, sir, are you part of the establishment? Hello, Charlie, yes, I am. You said that perfectly, Charlie. -I've been practising for years, Donald. Introductions over, Donald's also got an item he's not sure about. cos I really don't know what it is or if it has any value. Is it a fly swat? It looks to me like a horse whip. there for whisking the flies? This looks more North American Indian to me. What would they use it for, then? I don't know, perhaps the medicine man would have it. That's it, you've got it! Lordy, let's leave those two to their powwow. What's Margie been confronted with? -Are you going to hit me with that? Let me think - something to do with hair? Just think of the shape and what on earth you would need that for. -and the little holes the butter melts into. You just get the dough, boomph, down. Isn't that sweet? You worked it out! perfectly naturally as the batter cooked. you would think, "Oh, dear." 20 quid would have to be it. It's a bit of a hoot, isn't it? purely because I'm a crumpet girl. I love a bit of crumpet. but didn't Mark's mind games pay off? I know what this is, Whitefriars glass. "Swirl", I love the way you say "swurrul". which is really boring, isn't it? -it doesn't have the R.
it looks like a "swurrul", doesn't it? and then, in the 20th century. for popularising Art Deco designs. Is that your wife's price for yours? I think if that went to auction it would probably make £45. You're talking 30 quid, yeah. -"swirrul?" Not "swurrul". As in "squirrel?" Aye, like a language class, this, isn't it? and gets wider and wider and draws you in. It does, lie a "whurlpool". will take a bargain £20 for his silver knife and fork. That's got to be £20-worth, it's not going to make me a fortune. This is my sort of kit. Go on, then, that's fine. A safe bet, I would say. Safe bet for a tenner or 15 quid profit. I think I might be done. You've never been done in here. has come up with something else to tempt her. Ooh, an umbrella with an ivory handle! I won't put it up in here because I'm superstitious. -Let's see what state it's in. Wahey! It's quite pretty, isn't it? Yeah, but how much is it? It would cost you a whole £5. With prices like that, even you can be decisive. Go on, then. Aw, isn't he good? No, have it for £3.50. I'm going to give you a kiss now. leads Charlie by three lots to one. But he and Donald are still "swirulling"
"for my Whitefriars is probably a cracking good price." I think I would need half that again, Charlie. That just wipes my nose. is not one that's foremost in my mind. Give a boy a break. as you can with in with it. I have a wee flask here, Charlie. "Get the police, I've been robbed!" When my nose gets cold, I know I'm getting close to a sale. This chap's good, you know. could have brought that out of me. to the village of Glencarse. Don't I bring you to some good places? You do, I fill a massive profit coming on. This looks a very fine establishment. -Charlie Ross is the name. Pleased to meet you, Michael Young. -Does it say " Michael Young" above the door? But it says "Established 1887". That's not me, I'm not that old, Charlie. that they are still going strong. Enjoy the surroundings and I'm sure something will turn up. Do you fancy a crack at those? I'm not entirely sure of the purpose of them. I thought they were decorative, rather than practical. Are these ceremonial or something? -in some sort of crest. I don't know. Are they spears or paddles? I think they're spears because they are too pointed, aren't they? They're nice and sharp, aren't they? But they've got this kind of spade end to them. what they are either. Anything else? -Yeah, that's not in my price range. cos he's lost a little bit round the ear. at this, it's not in my price range, is it? Yeah, it suits you, you've got to have it. Looks the part, but he can't afford it, Michael. There's another nice dog head here, this is an umbrella. That's actually wood, isn't it? Yeah, it's wood, it's beech. which would be a bargain at £30, Charlie. Blimey O'Riley, you've rather knocked me sideways there. He's a whippet, I think. The greyhound family, isn't it? Very long nose. We'll settle at that and we'll settle at £30, Charlie. Hang on, just don't pressurise me. Be reasonable to an old man. Don't open it inside, that is bad luck, isn't it? No, Charlie, not when things were going so well. I would you say, "Charlie for you, 25 quid"? Charlie, for you, you can have it for £25. and to Charlie already has three lots for a fraction under £100. to seek out Scotland's oldest public library. but surely not a place to find a library. the keeper of the books. relocated to a purpose-built space next door. Are most of these original, 17th-century? but we started with just 400. And these all belonged to our founder. Right, but 400 was a lot of books. It certainly was, books like this one here. and this is a very famous book. and a conversation they have with three weird sisters. "all hail Macbeth, Thane of Glamis." -He wrote Macbeth in 1603, I think. That's generally what is thought, yeah. Goodness gracious me, that's unbelievable. Well, we call it that today but that was what people did. such is the Henry VIII Great Bible from 1539. So it is the first complete Bible in English. There he is, the man himself. "Long live the king." "Vivat Rex." -They didn't have a library card. a promise to return the book safe. "which we promise to return safe in a month." something David Drummond could never have envisaged. I've got something a little bit different to show you. Oh, my goodness. What's this? Mugshots? -It does look like that, doesn't it? Reading character by the lines on your forehead. -I think I've found me here. -So, what does the book say about you? -It's good. It's very good. -"Such lines signify riches and good fortune." I'm not so sure that is right. But that picture looks a bit more like Rosco to me. Night-night, you two. Be good. Next morning, Rosco's in a provocative mood. If you're going to catch me, you've got to spend the lot, girl. That's such a funny thing. It looks like a "swirrul," doesn't it? ..leaving him with over £200 to spend today. Now for the next stop in the city of St Andrews. they'll be back there later for the auction. -We're heading into St Andrews. but I can't tell you how excited I am. over the game itself and also because of the famous old course. A frequent venue for the British Open. I've got to stop. I've got to stop. This is heaven. Look at this! Look at this! What club do you think it is, Margie? -I think it's an 8 iron. -You're going to be rummaging, aren't you? -Oh, that's the right spot for you. Bye, darling. -Very pleased to meet you, Margie. ..and see if I can find anything that appeals. but I think that rummage may just slow her up. That's a whopping price, isn't it? items here, but hopefully Tommy can hustle Margie towards the bargains. There's an antique to fit all budgets in Rummage. That's the spirit. Good luck, you two. but Charlie's determined to seek out the older stuff, it seems. It's got a little bit of pitting, so it could well be the original glass. But it's a genuine antique and that's what I'm looking for. and now Charlie with a new-found determination. I've got over £200 left. and only buy something that I know has got a profit in it. Well, your best bet I hear is to head over to Jim's corner. -That's rather sweet, isn't it? It's got a little dent in it, but that's not too bad, is it? Cut glass and silver atomiser. How Art Deco is that in design?! It could well be American. I don't like the price, but then have I ever seen a price I liked? that is a traditional atomiser. is hallmarked silver and it's Birmingham. I just think that other one is so much more stylish. -Isn't that a beautiful shape? -Is that a magic cupboard? -Nicely done and nicely cut body. -Time to talk to Jim about those. -How do you do, Charlie? If I said to you, "How much would the five pieces be?" -what would be the answer? Tell me if... Are you sure? -Happy? You're not going to regret it? Well, that's some lot you've got there, Charlie. What will Margie make of it? Margie, guess who's bought more silver? Any progress down the road, I wonder? -We've got this nice screen over here. -Does that catch your eye? -Oh, the screen. My gosh. Yeah. -I think that's got 65. -Yeah, yeah, yeah, yeah, yeah. I think that's a no, no, no, no. -It's got to register with you, hasn't it? -It's not striking a chord? -It's not. No, it's not. -Sorry, Tommy. We're used to it by now. -Moany old thing, aren't I? -Tommy's wisely refraining from commenting. But Margie does seem to have a real dilemma. -and I don't think I'm going to find it here. Perhaps it's time to move on, girl. -Do you want to throw me out? -If that's the way it has to be. to meet Britain's foremost meteorite hunter. -Lovely to meet you. Meteorites, is it? -Would you like to see some? -I'd love to see some. -Come on in. We'll show you around. Crikey. This is amazing. What is the definition of a meteorite? Well, a meteorite is a rock from outer space. It comes from way out there, beyond the orbit of Mars. It's a piece of the asteroid belt itself. It hits the atmosphere at 20 miles per second. At those kinds of speeds, it doesn't stand a chance. are maybe, if you're lucky, the size of something like this. That would be in an exceptionally large piece. -Blimey. You wouldn't want that coming through your roof, would you? -It is. It's got iron in it. to track them down, wherever they descend on Earth. -And where did that land? -So, how did you acquire that? -I bought that from the finder. I love the thought of a beautiful meteorite against an ugly meteorite. Rob gets out his detector to hunt meteorites in the UK as well. they're worth quite a bit more. and said that they wanted a meteorite in the shape of a star. I said, "Well, I can't do that. I can give you a meteorite,"
-and Michael Jackson was very happy. -You couldn't cut a bit into a star? It seemed like a lot of messing around, so I didn't. towards the Ural Mountains and nobody wants to be hit in the Urals. -so many problems in the news. -How did you get hold of that? and got them all out hunting. -Have you been out there? I work for the military and Russia wouldn't give me a visa. -But I could go on your behalf? -Is there an export licence? but he does want to buy one more lot for the auction. So, does Rob have an affordable meteorite? -It's got a lovely sheen to it. And the age of that? How much would that cost an old antique dealer? ..it would probably be in the hundreds. But to yourself, what does 30 quid sound like? Absolutely amazing. I've got no comparison to go with. Looks like we've settled on 25. Well, that probably makes it the oldest thing that's ever been bought on the Road Trip. Meanwhile, on Earth in St Andrews, Margie's still on the back nine. -But Charlie's old shop is around here somewhere. let's just hope our Margie heads over to see Jim. -Thank goodness I didn't break anything. Yes, quite. Keep in his good books and you might get some bargains. -The ones that Charlie hasn't already snaffled. I've seen something I like. Are you ready for this? It's a Capstone inkwell. Silver one. At least it wasn't by you, I suppose. It's Deco, really, isn't it? 1930s. The price has got to be right. -Jim, can I have some help? which has had a bit of a life. -I could do it for 40 and that gives me a little bit. -That gives me a little bit. -Just easing it a bit. -I'll take another fiver off it. -I think she's pleased. So, £35. -Well, I've got to have that. But is there anything else, bearing in mind that it's getting late? Right. Come on. What have you got that I can make it profit on? You're a good old dealer. I have fallen on my derriere with these. -I can do that for five. Oh, God. I hate them. -It's a nice piece of wood. tap the thing and annoy me. when Margie managed to get that parasol for a knock-down price. and she's being a bit sniffy about it. -No, the two are 39. -Yeah, OK. Let's go for it. it's time to take a look at what they bought. -Get them off?! OK. I'll get them off. -and I struggle to find any. -You've mopped it all up. -Where did you buy all that? -that you followed in afterwards. -Yep, Charlie's mopped it up. Now, do tell me, how much for the five? For the five... I paid 50 quid for the lot. -Look at that doggie's head. It's beech wood. That's really nice. That could make £55-£60. -Now, will she be gunning for those? Well, I think the carriages are post-war. They're horrible. -I think these barrels might be a bit earlier. -With a bit of verdigris sprayed on. -I like a bit of verdigris sprayed on. And there's my coup de grace. -I brought it from my man. That's aged since you bought it, Charlie. And he sold it to me for £25. but I love it and if I was allowed to, I'd buy it myself. -Time for Margie's inexpensive collection. -Hello! I know where you bought that. -It was in the same cabinet as these. -Oh, I thought there were a lot of gaps in there. I thought I'd leave you something. -But my back's to the wall, is it not? It certainly is if you bought that! -You don't know how much I paid for those two together. I think that at auction will make about 50 quid. -And that will make 10 to 15. -You put that for 35? -You clever clogs, aren't you? -Clever clogs. What on earth is this?! -This is just for you. -Doesn't juice something, does it? -No. You're never going to guess. Oh, hang on. It's not for crumpets, is it? Is it a crumpet maker? That's fab. -How did you guess that? Well, I think you're both wrong. This is about the same sort of genre. You can actually put that up because it's not damaged. Like a Scottish thistle. Do you know how much I paid for it? You're not going to make hundreds, but you're back on the road. -Miss Cooper's back on the road. Come on. I think Charlie's playing a very, very good game. at 20 quid is frankly a steal. She'll double her money on that. and not spent a lot of money. But unless I have a complete disaster, I will still be ahead. at an auction in Fife at St Andrews, once they get over the links. Shall we go across here? Look. -Let's pretend we're on a golf course. -We've got an exhaust pipe to worry about. That's the least of your worries, your exhaust pipe, I can tell you. This is not wacky races. Get back on the road, you two! -Oh, my goodness! Hang on. and also a funeral director's. who preside in their own unique fashion. Shake me by the hand, sir. and she's parted with a mere £82.50, also on five lots. -Now, time for Ian Urie to hit them with his auction stick. -Plenty of people for my things. I don't think there will be anybody for yours. Lot number five! Charlie's scent bottles...and much more. The bid is with me at £16. Blimey, Charlie. That's a poor start. It's not much of a loss. I'm worried about his Whitefriars now. Who will start me off at £1? Any advance on £10? I hear 11. -It's getting there. It's getting there. -We're going to be here all afternoon. Oh, dear. How's the rest of the day going to go? Well, that's a very reasonable bit of Whitefriars for someone. -How could you start a Whitefriars bowl at £1? OK. Margie's barometer can't fail though, can it? Surely? £6. I've made a profit. Margie's miserly spending could pay off here, you know. This is a one-way ticket to success. How about Margie's even cheaper parasol? He started at £1 again. -He's going the entire way in £1 bids. This is fantastic. 18. 19. 20. -My little man over there. He's on fire, that auctioneer. The sun continues to shine on Margie. I bet it'll go with a bang! -It cost £35 and he started with £1. This is definitely not Charlie's day. and made more money than that. What about his whippet-handled parasol? Do you know, I thought I'd completely stolen this at 25 quid. Someone's acquired a bargain brolly. -I'm feeling a bit sorry... Are you all right, chap? Now for the inkwell that Charlie could have bought. -The bid is with me at £32. 32 quid and you're off. 42. Any advance on 44? -And to you think I could've bought this? -and you bought good things. -I'm not sure you're right, either. a couple of hundred quid and buy the whole sale. Another quality item, Margie's little silver set. Butter knife and butter pat fork. And the bid is with me at £18. -There's that lady in the front row, she's such a good buyer. I'd buy that over and over and over again. £22. You almost got away with it, Margie. I mean, it was Edwardian. Join the world of disappointment. In perfect condition, in a box with pearl handles. Shut up, Margie. It could be a lossmaker. Lot 84 is the mystery object. -I wonder where the bidding will start? -Who wants it for £1? of no small wealth. He probably knows what it is! That one didn't rise to the occasion, did it? -I don't care what it is, I've lost £10. Watch out, Charlie. Heaven knows what will become of your meteorite. I've never seen an auctioneer look so excited. The bid is with me at £22. -Nobody else knows what a piece of heaven on earth is. Charlie's lost on every single lot. Know what I think of this auction? Here's what I think of the auction. So, it's Margie who's the winner today. and a narrow lead. He's not happy. leaving her with £221.82 to spend next time. Right. Let's get out of here. Sharpish. You are brilliant and I'm rubbish. -Oh, don't make a profit on this.